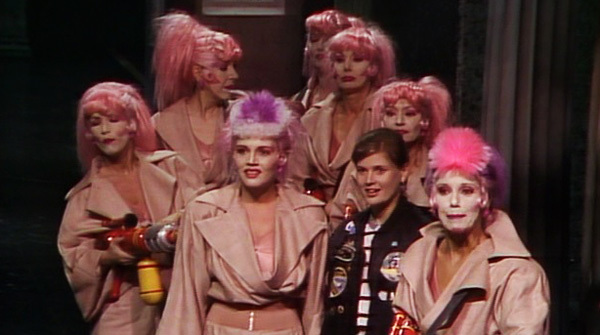 Doctor Who: Revisiting THE HAPPINESS PATROL | Warped Factor - Words in the Key of Geek. 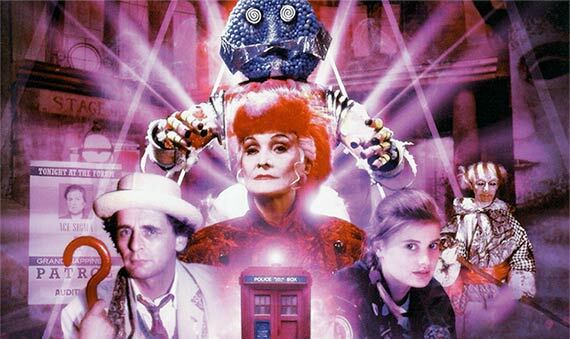 The Sylvester McCoy era, both past and present and one can safely assume in the future as well, has received a pretty bad rap from some fans. There are stories that have been criticized from production values, scripts, performances and other elements. Even as someone who is a proud fan of the Seventh Doctor and his era, I admit that some of that criticism is valid. However, there are stories from the McCoy years that aren't quite as deserving of that rap, and The Happiness Patrol is a perfect example of this. There's the script for example. Graeme Curry's story takes the Doctor Who cliché of citizens vs. an evil government and turns it into something more. The Happiness Patrol was famously the subject of a tempest in a teacup scandal back in 2010 for the fact that it was a satire of Thatcher's Britain with Shelia Hancock's Helen A being based on her. That element is present without a doubt and it's easy to detect for anyone familiar with Thatcher and her politics, from Helen A's slogans to the drones being told to down tools (a reference to the infamous miner's strike of 1984-85), but there's more to the story than that. There are elements drawn from tyrannical governments from around the world, including references to an entire village being raised to the ground and mass disappearances similar to events in Chile and Argentina. The titular Happiness Patrol, once you move beyond the colorful outfits, call to mind elements of Soviet secret police and intelligence organizations, from members turning on each other (including an informant being pinned with a medal only to be executed). All of this mixing and matching of elements forms only a part of the script though. For into this, set on a colony world centuries in the future, Curry also throws in a larger moral message. It was this message that became the starting point for the story: a planet where the state of happiness is required to be a permanent one and that the penalty for being anything but happy is death. The choice of happiness as what's being enforced is an interesting one. It's an abstract one and by choosing it over a more obvious choice of ideology (be it communism, capitalism or whatever) it also gives the story an originality it might not have otherwise. It also allows for interesting discussions, such as the scene between Ace and Susan Q or the final confrontation with Helen A in part three. As much as it is a political satire and commentary, The Happiness Patrol is about the need for real emotions (be they either positive or negative), how they are far more important than trying to maintain or force upon anyone the appearance of happiness or normality. It's a mix of commentary, satire and a morality play that Doctor Who especially seems good at. Yet for a story that tries to point out the importance of looking beneath the surface for what lies beneath, that seems to be what most people focus on. It isn't hard to blame them. Being the three part, studio bound story of Season 25, the story feels exactly that way. Old Who had been accused by some of looking cheap and, for all the pluses of this story, this could be a case where that was true. The studio bound feel shows the limitations, with cramped streets representing the city where much of the story takes place. Despite decent blasts accompanying them, the guns carried by the Happiness Patrol look anything but impressive. Beyond the human characters in the story, from the pipe people to the Kandy Man, neither of which are exactly impressive pieces of design (in fact the Kandy Man couldn't be farther from what Curry originally had in mind in his script). There's also some iffy performances including an over the top one from Helen A that rather undermines the attempt to make her a villain. Yet look a bit further beneath the surface will you? Beyond some of the cosmetic issues, The Happiness Patrol has more to offer. Some of Chris Clough's direction is excellent, especially the street scenes with a series of canted camera angles, which help to give the story a sense of menace and tension alongside the humor and satire. 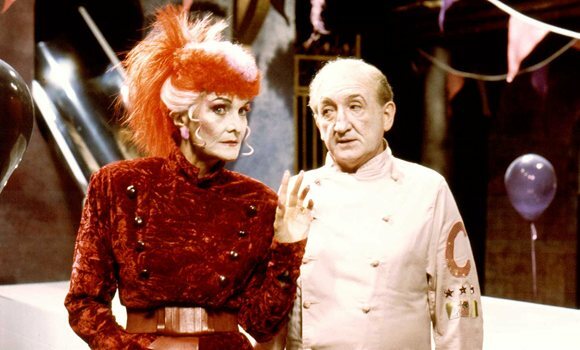 While Helen A is an over the top villain, her various minions (including the title ones) are actually highly effective, such as Rachel Bell's Priscilla P. There's also a strong supporting cast including Richard D. Sharp as Earl Sigma, Lesley Dunlop as Susan Q and John Normington as Trevor Sigma. As cheap as the sets might look, they and the costume add to the atmosphere of the story by showing Helen A's world for what it is: a fake fascade. It's quite meta in a way but one that works quite well if one gives it the chance to. Then there's the moody and evocative score from Dominic Glynn with its blues influence, which, like the story itself, mixes a disparate amount to present an intriguing result. Ultimately though, the star of this story is its Doctor. Sylvester McCoy, more comfortable in the role after a shaky first season, gets moment after moment to flex his acting muscles and show his not inconsiderable range as an actor. There are opportunities for McCoy to show off his comedic skills which, unlike in the previous season, get more of a chance to sit alongside his dramatic skills. It's those skills and McCoy's ability to play the serious and authoritativeness of the Doctor that gives The Happiness Patrol some of its best and most powerful moments, such as his speech to the rooftop snipers in part two and the aforementioned final confrontation with Helen A in part three. 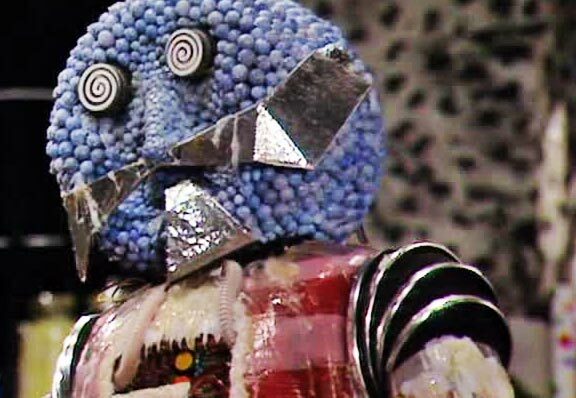 For all of its reputation as a low point of Doctor Who's first television incarnation, there's more to The Happiness Patrol than is apparent on first glance. It's a story that, once one looks beyond the surface of its production values and a couple of questionable choices, has much else to offer. There's Graeme Curry's script which mixes together political satire and commentary with a serious message. There's the better part of the production as well from the direction to its score and performances. Or to put it another way: It's not quite as silly as its looks would make you think, is it?